Could you support your local community in a uniformed and tasked capacity? We are looking for volunteers to become involved at the heart of their local community and being a point of contact for around 2-6 hours a week. 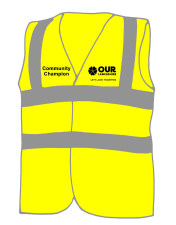 We are looking for Community Champions in several areas in Lancashire. Initially the role is being introduced in Coppull, Up Holland, Garstang and Hesketh Bank. This is a uniformed role that will require being visible to the public and ready to answer enquires and assist people wherever possible in a professional and respectful way. The post holder will be expected to liaise with local public services. Update – Longridge area will be coming soon!